Flexible work arrangements are often ad hoc, either implemented by an employee on his or her own with no agreement by the employer, or produced by a secret deal between an employee and supervisor. This can create problems for the employer: valued employees who need more work/life control and do not know that flexible work is an option may decide to leave. Moreover, when employees are aware of others’ deals but are not able to get a similar deal, the appearance of favoritism could erode morale or even lead to legal liability. What’s better? A written policy. It gives the employer control over the terms of the program and provides guidelines for managing it. It also gives the employer the opportunity to encourage employees to use the policy to manage their work and personal obligations, thereby reducing unwanted attrition and flexibility stigma. Designed by the organization. The best flexible work policies reflect their companies’ unique cultures, business needs, values, and goals. Off-the-shelf policies rarely fit well. The most effective policies we have seen have been crafted by committees that included employees at various stages of their careers with a variety of personal interests, and have articulated the business reasons for offering flexible scheduling. Allows employees to create schedules that fit their needs. Some companies have resisted formalizing their flexible work programs because they (wisely) do not want to limit the ways their employees can work by specifying acceptable types of arrangements in a written policy. They know that if employees need to split their work days between home and office, a policy that provides reduced schedules or compressed work weeks will be of little use to them. Policies can be written to allow creativity in the design of schedules to meet the needs of employees, the employer, and customers while still providing sufficient guidelines to make the policy meaningful and manageable. Reflects support of top management. Flexible work programs are often undermined by messages – usually unspoken – that employees had better not work flexibly if they want to get ahead. Policies that have an introductory paragraph stating why top management supports flexible work may erase those messages. Provides all necessary information and fair terms. 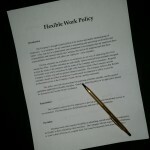 Effective flexible work policies include: a statement of eligibility (ideally, all employees in good standing are eligible); a process for proposing a flexible schedule; the effect, if any, of flexible work on compensation (note that compensation for employees working reduced hours should be proportional to their schedules such that the percentage reduction from a full salary matches the percentage reduction from a full-time schedule); the effect, if any, of flexible work on advancement (again, any effect should be at least proportional); guidelines for work expectations, availability for emergencies, and responsiveness to customers; a mechanism for compensating employees who work more than their schedules; and a timetable for periodic review of how the schedule is working. Implemented strategically. No matter how good the policy, if it is not implemented well it will likely die on a shelf or sink under the weight of stigma. The first step is a carefully planned rollout of the program, including introduction by the CEO and training for everyone in the organization. The flexible work program is more likely to succeed if the organization appoints a manager to oversee the program and troubleshoot any problems, provides resources for employees working flexibly and those who supervise them, and holds supervisors accountable for the retention and advancement of flexible employees. Most importantly, the organization should take steps to eliminate stigma, such as training everyone about flexibility bias, enlisting key players as change agents, supporting and promoting flexible employees, and squelching negative talk. Benchmarking and periodic re-assessment will help the organization to determine the success of the program.